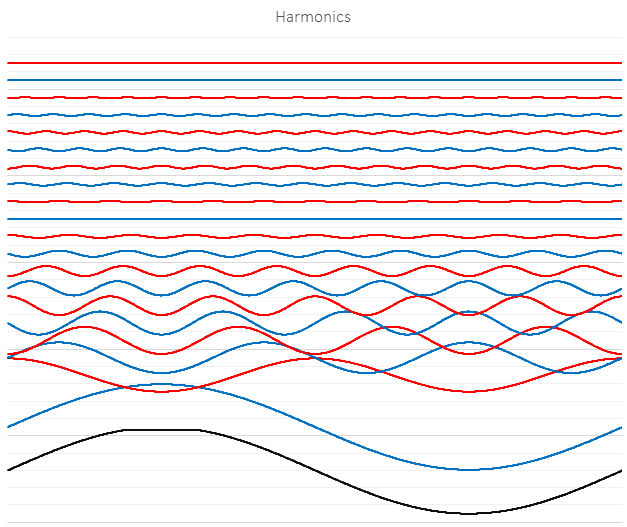 I have created a fairly simple Excel Spreadsheet to allow you to generate a waveform and then look at the constituent harmonic waves. Start by downloading the spreadsheet, then follow the instructions below. Open the file in Excel, then put whatever wave you want in the 2048 samples in column B. Currently there the start of a square wave there, but you can put whatever you want there, just make sure it's 2048 samples long. Go to Data and choose data analysis on the far right and then Fourier Analysis. Make sure the input range is set to D3-D2050 and the output range to F3-F2050. After the FFT is done, look to the right in columns W-AR and look at the constituent waves. The phases and amplitudes come from the frequency domain data in columns AK-AY. If the harmonics are too small to see, try gaining them up by changing the value in cell AH2 which is multiplied against every harmonic except the fundamental.